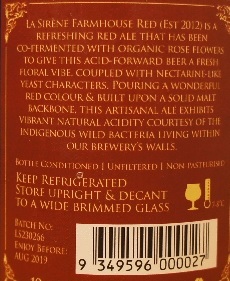 Brewer Description: (from bottle) La Sirène Farmhouse Red (Est 2012) is a refreshing Red Ale that has been co-fermented with organic rose flowers to give this acid-forward beer a fresh floral vibe, coupled with nectarine-like yeast characters. Pouring a wonderful red colour & built upon a solid malt backbone, this artisanal ale exhibits vibrant natural acidity courtesy of the indigenous wild bacteria living within our brewery’s walls. Intro: A 375ml bottle, with an enjoy before date of August 2019. 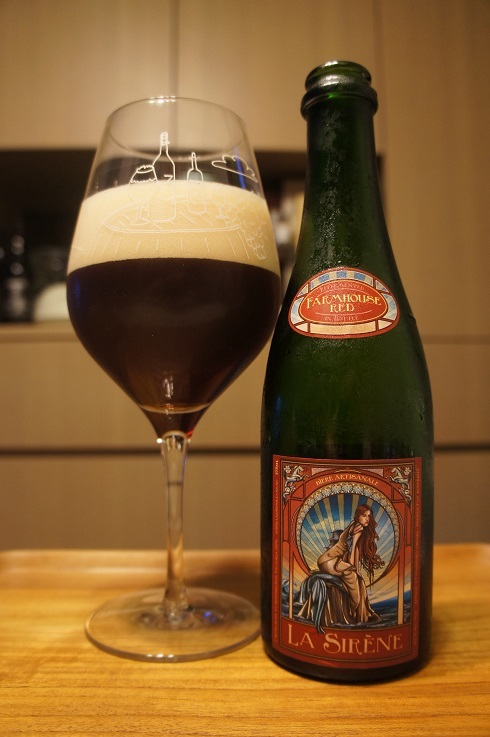 Poured into a 3 Fonteinen stemmed Zenne glass. Appearance: A slightly hazy reddish brown colour with a big three finger off white head that had good retention and left some nice spotty lacing. Aroma: Lightly tart, candied cherry, yoghurt with hints of toffee and balsamic vinegar. 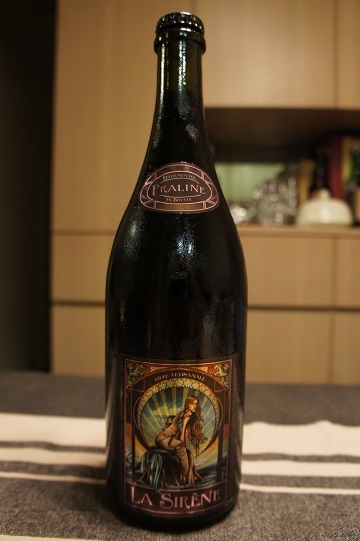 Taste: Lightly sour, tart, mild fruit, cherry, plum, mixed berries, almost like watery red fruit juice. Mouthfeel: Medium bodied with soft to moderate carbonation. Overall: Nice aroma but taste didn’t quite match. Sour and tartness was good, but the fruit (red fruit, dark fruit, mixed berries), while there, were rather weak. Carbonation was also softer than I’d hope for. Other Notes: Contains nuts & lactose. Bottle conditioned, unfiltered and unpasteurised. 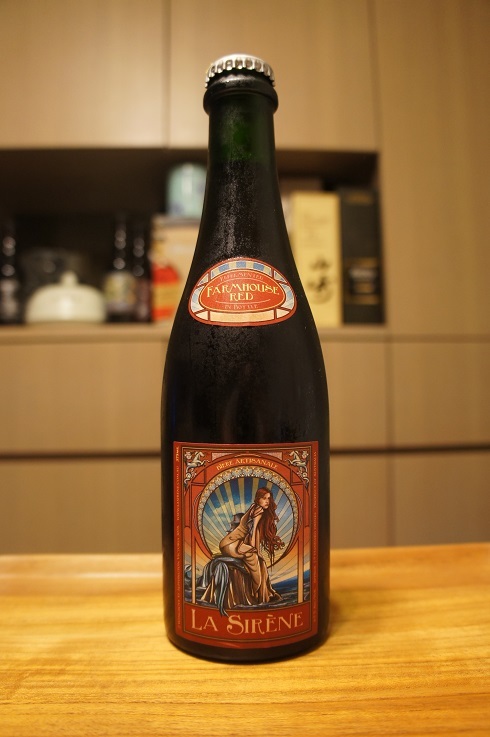 Brewer Description: (from bottle) Our award winning La Sirene Praline is a very special Belgian chocolate style ale. Belgian dark malts combine with organic vanilla pods & cacao nibs to provide a delightful contrast of sweet & savoury. Smooth & velvety with a creamy body & fluffy head. 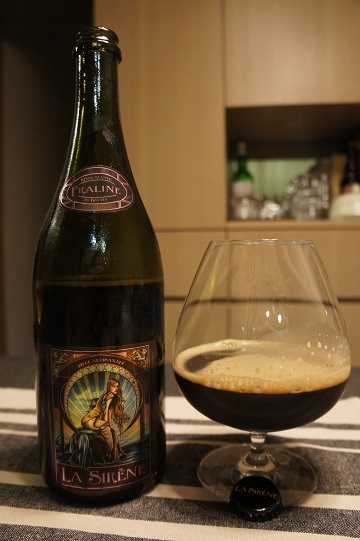 This delicate, balanced dark ale is a seductive chocolate praline beer experience. 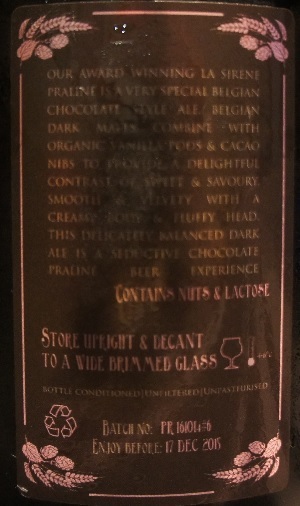 Intro: A 750ml bottle with an enjoy before date of 17th December 2015 (so drank a little late, but I’m not so worried for this style). Poured into a snifter glass. Appearance: It poured a clear dark brown colour with an amber hue and a fluffy but thin half finger tanned head that didn’t retain too well but left nice spotty lacing. Aroma: A very nice sweet hazelnut and chocolate with a hint of brown sugar. Taste: Much like that aroma, a tasty chocolate hazelnut cake. Mouthfeel: Light to mid body with light carbonation. Overall: This surprised me a lot. A very tasty beer that could replace dessert yet surprisingly not too sweet for me (and there are a lot of beers that I find too sweet). I would definitely buy this again. 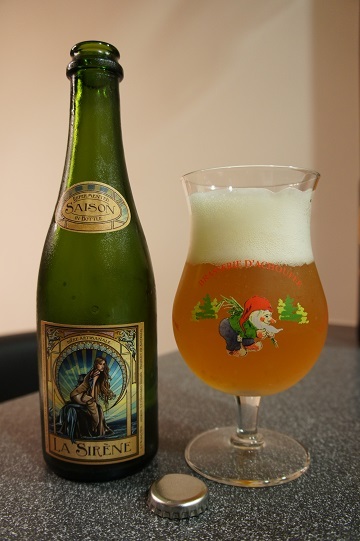 Brewer Description: (from La Sirène website) La Sirène Saison is a beer that is special to our hearts and is a tribute to the style born in the Wallonia region of Southern Belgium where these Farmhouse styles were brewed to quench the thirst of field workers. Our classic award-winning Saison pours a deep golden ornage with aromas of wild fruits. Complex rustic flavours of spice and a little funk (courtesy of our yeast) combine deliciously to finally deliver a dry crisp finish. Santé! Intro: Don’t really like it when a beer doesn’t have a bottled date or even a best before date, and there were none here. Poured from a 375ml bottle into a tulip glass. Appearance: The beer poured a very hazy golden orange colour with a thick fluffy two and half finger head that had pretty good retention leaving a quite thick lace ring. There was also quite a bit of sediment at the bottom of the bottle. Taste: Tart sourness, funk, orange, lemon, apple then leaves a lasting pear aftertaste. Mouthfeel: Crisp, light with good carbonation. 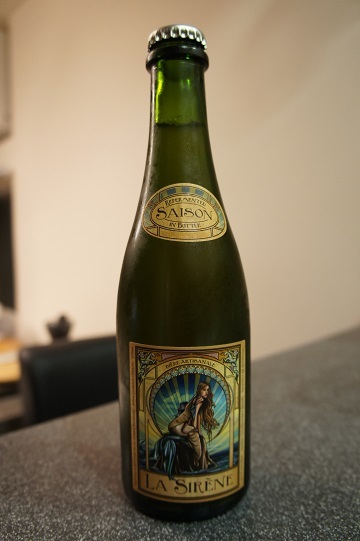 Overall: A nice crisp saison that I would probably buy again. Very refreshing.